An office kitchen is incomplete without a coffee machine. Treating the office visitors with a cup of hot coffee will even help in building good business relations with them. A coffee machine is not a luxury in an office anymore and it has become a necessity. There are researches that suggest that having small amounts of caffeine everyday helps in improving the mental performance of people. The caffeine in the coffee has the capacity to keep people alert. If treating guests with coffee is a norm in an office, then there must be a conscious effort in finding out the best coffee machine for the office. The following are some of the recommended coffee machines for office use. 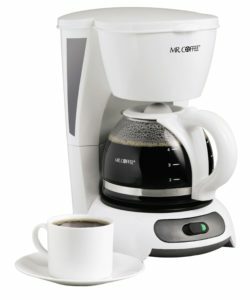 The Mr. Coffee 4-Cup Switch Coffeemaker is an ideal office coffee brewing machine that is very simple and easy to use and brews the best coffee. The unique feature of this machine is the pause and serve feature that allows the user to pour the coffee even when the machine is brewing coffee. This is very useful in offices where an instant cup of coffee is needed. A dual water window will reveal how much of water is left in the reservoir. There is an on and off indicator to easily find out if the machine is on or not. The coffee filter basket can be easily removed for quick and easy cleaning. The warming plate on the machine is stain resistant and hence is very easy to clean. The 4-Cup Switch Coffeemaker from Mr. Coffee weighs 3 pounds and is a compact machine that is suited for small or large office kitchens. 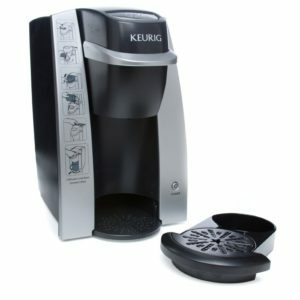 The Keurig K-Cup Brewing System is a compact and ideal coffee making machine for small offices, apartments and homes. The guests and visitors can be pampered with tasty and delicious fresh coffee as this machine is designed with hospitality in mind. The machine is very simple to operate and works on a step by step process. The coffee machine can brew about 8 ounces of coffee within 3 minutes. It is very easy to clean and need very little maintenance. The main feature of this coffee making machine is the mug sensing feature. This ensures that there are no accidental coffee slips and no need to deal with messy filters. The unit is fitted with an automatic power on/off function to save power. The machine weighs just 7.2 pounds and consumes a power of 700 watts. The brewing of the coffee takes place within the K-cup pod that can be easily discarded. This coffee maker has the capacity to brew a full pot of coffee in 3 minutes. It is the fastest machine to make 10 cups of coffee and is a very useful unit to be used in offices and homes. The hot water in the unit has been always ready so that a coffee can be brewed in no time. The unit comes with multi-stream head showers that ensure that hot water is sprayed on the coffee grounds evenly. The carafe is drip free and has an exclusive spout design that ensures the coffee is poured into the cup. The wicks of the coffee are moved back into the carafe while pouring to make sure that the cup does not get messy. 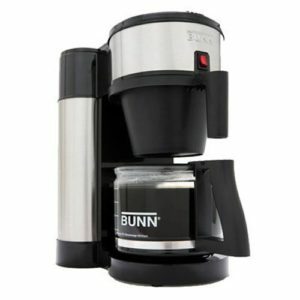 The BUNN NHS coffee brewer has a huge bottom filter and funnel so that the hot water and the coffee grounds have a greater interaction to provide the best flavored coffee. If you have really small office and need space saver, small and cheap coffee maker this is great option to buy. 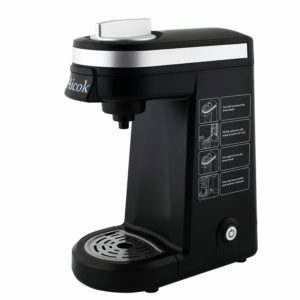 Of course you can find better coffee machine for your office but Aicok has a great balance value for the price. We also include Aicok coffee maker in our list Cheap Coffee Makers that Use K-Cups. For under $40 you get very good very small even appropriate for travel Aicok coffee maker. The Aicok Single Serve K-cup coffee maker is the affordable and best coffee machine for small office. The water reservoir and the drip tray can be easily removed. The drip tray allows enough space for travel mugs and larger cups. The water reservoir has a 12 ounce capacity and therefore several cups of coffee can be brewed with one water refill. The unit has a K-cup design that ensures that most of the coffee serving cup size is accommodated. The quick brew technology helps in making a cup of freshly brewed coffee in about 3minutes. The Aicok Single Serve K-cup coffee maker is very easy to operate and clean. It comes with one touch button controls for quick operation and also is an auto shut off machine that will help in saving power. The water tank used in the machine is BPA free. The brewer is a very good option for small offices, trips, homes and dorm rooms. 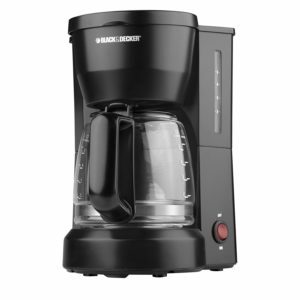 The Black & Decker 5-Cup Coffeemaker are very compact in size and is a very good option for small offices, apartments, homes and dorm rooms. The unit operates with one touch feature and therefore brewing a cup of tasty and hot coffee is a very simple task. They keep hot plate on the machine ensures that coffee can be had at anytime without any fuss. It will keep the brewed coffee hot for about an hour. The coffee maker comes with dura-life glass carafe that lasts a long time and comes with level markings for ease of use. The filter basket can be easily removed and can be cleaned in a dishwasher. The water view window has measurement marking sot brew the perfect amount of coffee. The unit has a cord wrap feature that will help in easy storage. The machine is designed in such a way that it saves a lot of space. The above mentioned coffee makers each have different styles, looks, functionality, durability and coffee making prowess. When looking to buy the best coffee machine for office, it is important to check out the features, the coffee brewing capacity, the power that the machine consumes the size of the machine and its costs. If the office has a very small kitchen, then it is worth investing in a small sized machine that can brew only one cup or 4 cups of coffee at a time. With a little bit of research and time it is very easy to buy the most suited coffee machines for an office. It is difficult to generalize and accurately determine which is the best coffee machine in the office. It depends on many factors: price, number of employees, size of office, needs and coffee preferences of workers, directors..